The Queen of Hearts has become quite a big hit all over Europe, although if you live in the US then you may not have seen or heard of it yet. Although not quite approaching cult classic status yet, like the Book or Ra (in Europe) or Cleopatra (USA), it is certainly a very popular slot game that people search for when they visit a casino. Here, you can enjoy our totally free demo of the Queen of Hearts slot machine. There is no registration required to play, just allow the game to load in the browser (should only take a few seconds) and enjoy discovering the fun to be had. With the name Queen of Hearts, the first thing that will cross your mind will be the intimidating Queen from Alice in Wonderland, whose fear inviting disposition resulted in a number of white roses being painted red. However, Novomatic has been inspired by an entirely different Queen when creating its 3 rows, 5 reels and 9 paylines video slot. The highest value icons are of course the symbols associated with royalty and those that have blue blood running through their veins – a Monarch’s Crown, Ring, magnificent Castle, Red Rose, the fair Queen and the highest value icon of all, the Red Heart. As the Scatter symbol, the Queen will activate the sessions of 8, 15 or 20 free games that are set in motion as soon as the combination of 3 to 5 of these symbols lands on the reels. The bonus game may end with a random Cupid icon appearing on the screen and awarding the Heart symbols, which will remain on the reels and generate payouts even after the Cupids are gone. The total cash out can amount to 1,000,000 credits per line for up to 5 collected Red Heart icons. Pokie players in New Zealand and Australia are also in luck since Novomatic releases can be easily found on gaming platforms that welcome members from these two countries. The best part is that Novomatic games come in fun-play mode, so there is nothing to lose if you decide that Queen of Hearts pokie is not really your cup of tea. 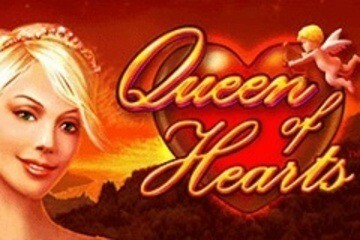 If you have been to a casino in Europe recently, you might well have played this Queen of Hearts slot game. It is popular in the Gaminator machines in the UK and the Novoline machines in places like Germany, Italy and France. Hopefully, the game arrives in Vegas sometime son. The nearest place I have seen it to the US is in The Bahamas. Not too far to travel if you live in the South East of the US, but probably a bit far is you live in Vegas.